Kube Kreations was an idea I had while attending community college. I wanted to customize my cube so I made this program. 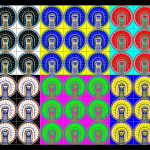 It can can load an image for each side, invert colors, repeat a 3X3 grid. It then has the option to save a bitmap that is laid out to be a 4X6 print out from a home computer. It has guidelines to help cut. 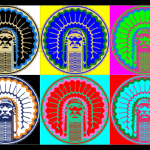 I used glue and clear nail polish to create my own Chief Illiniwek cube, below are some images that could be printed. To make your own, download the windows msi installer located here.